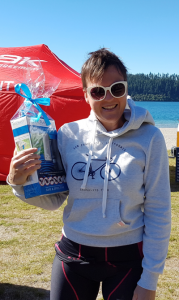 Spectacular weather graced the Rotorua Association of Triathletes and Multisport club at the annual Blue Lake Multisport Festival (BLMF), in Rotorua this past weekend. 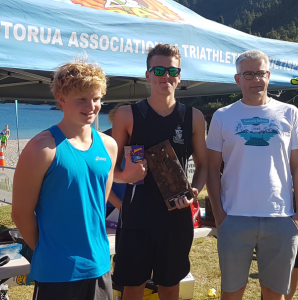 Some 400 entries over the two day event included local families, friends, athletes and organisations around the North Island. Event Director & Club President Graham Perks says, “The Blue Lake Multisport Festival is our main fundraiser for the club and it is hugely significant to us to have Ecomist on board as our naming rights sponsor. This is a wonderful part of New Zealand which needs to be celebrated and the support we get from Ecomist and other sponsors ensures we can showcase it in the best possible way by having people swim, bike and run.” Graham says the Blue Lake Multisport event is one of the longest running events in the country, celebrating their 31st year. On Sunday, Sam was crowned Queen of the Lake, Sam says she has competed for 5 years and was so proud to win the overall prize, something she can share with her family and children. 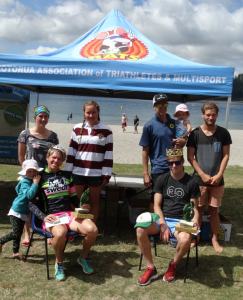 Kieran McPherson, an avid triathlete who is competing internationally as well as in NZ, was crowned King of Lake. 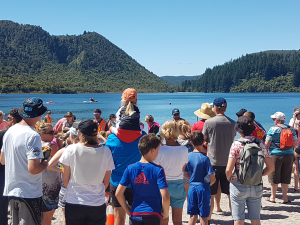 The 2k Hinemoa Swim trophy competition is a legendary competition across the lake, with the swim tradition dating back before the 1960’s. 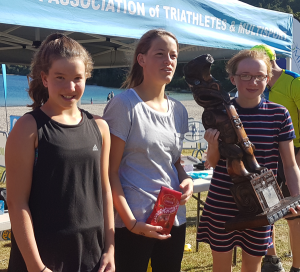 The BLMF asked the Council if they could use the trophy for the Blue Lake 2K swim without a wetsuit, in 1994 and they been fortunate to continue the across the lake event and awarding athletes with the Hinemoa trophy each year. BLMF kids triathlon was also a big hit – children as young as 4 competing in the cycle, run and swim competition. And to conclude the weekend a 5K fun run and walk allows everyone a chance to enjoy a trek around the beautiful Blue Lake. Spot prizes and giveaways were also part of the weekend and Ecomist Starter Packs were up for grabs along with the Ecomist Bug Bullet personal repellent, a handy summer must have by the Lake. Natalie Riddler claims one of the Ecomist Prize packs on Saturday. Graham says, “We have a wonderful range of events and encourage people to enter and mix it up, we know anyone who does the event once, loves it and is always keen to come back.” The funds raised from the event helps the Rotorua Association of Triathletes and Multisport to grow as a club and target increasing participation in the sport. “This year we have introduced some Triathlon Fundamentals coaching sessions with a paid coach which has enabled us to reach further into our communities and get people active,” he says.